Get Ready… Humans are about to become obsolete. Over the past several decades, technology/software has become an integral part of every occupation in the nation. Little did we know that we were actually training out replacements. As business owners sought to cut costs and implement cost-saving policies, we were all asked to write down every task we perform throughout our day. Then we were put onto automated TimeClocks which were tracking our time worked in comparison to the work output. Then, as AI developed, the computer began to monitor our every move. Every click of out keyboard, every swipe of out mouse. With cameras and microphones in every device, AI was able to monitor every move of our bodies and every sound we made. AI was learning… learning by repetition, what was required to perform our job. WE HAVE BEEN TRAINING OUT REPLACEMENTS! Now as they roll out the new automated versions of us, they are convincing us that we are needed to monitor the robot… but actually, we are just temporarily needed to give the robots actual real-time experience to practice what they have learned. Once they have been proven to be successful at completing the tasks…it is BYE-BYE HUMAN! If you think you are immune… think again. AI is already beating us at our own game and our own work. Although modern AI systems still have trouble deciding whether or not to flip that stranded tortoise in their path, they’re already outpacing the intellectual capabilities of their creators in a wide variety of fields. From beating grandmaster Go players to outguessing cardiac surgeons, lipreading to audio transcription, neural networks and machine learning have already surpassed humans — and that list is only going to grow longer. BY ELLEN RUPPEL SHELL ON 11/20/18 AT 5:04 PM EST – excerpts shown below, to view the entire article click the link above. By garbage, Lindner meant human error, the alternative to which is apparently robotic precision. And robots can be very precise, especially when it comes to routine tasks. 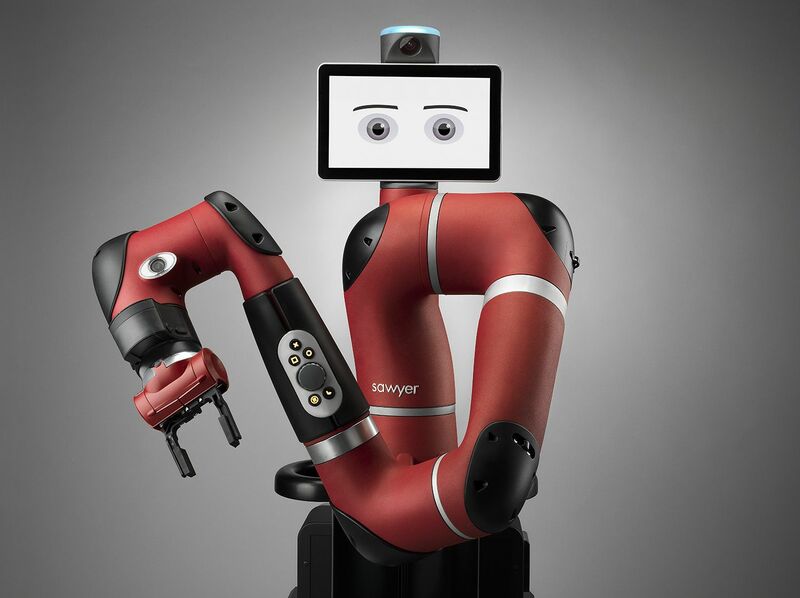 Sawyer, an industrial robot created by the former Boston-based Rethink Robotics, offers an impressive illustration of how all-embracing a robot arm can be. Sawyer is the brainchild of Rodney Brooks, the inventor of both Roomba, the robotic vacuum, and PackBot, the robot used to clear bunkers in Iraq and Afghanistan and at the World Trade Center after 9/11. Unlike Roomba and PackBot, Sawyer looks almost human—it has an animated flat-screen face and wheels where its legs should be. Simply grabbing and adjusting its monkey-like arm and guiding it through a series of motions “teaches” Sawyer whatever repeatable procedure one needs it to get done. The robot can sense and manipulate objects almost as quickly and as fluidly as a human and demands very little in return: While traditional industrial robots require costly engineers and programmers to write and debug their code, a high school dropout can learn to program Sawyer in less than five minutes. Brooks once estimated that, all told, Sawyer (and his older brother, the two-armed Baxter robot) would work for a “wage” equivalent of less than $4 an hour. …human workers are complicated. We get tired, hungry, distracted, angry, confused. We make mistakes, sometimes egregious ones. Machines lack our frailties and biases and are better equipped to weigh evidence fairly, without prejudice or false assumptions. Perhaps most critically, machines can retain and process data far more accurately than we can, and that data is growing exponentially. Every minute of every day, Google services 3.6 million searches in the United States alone. Spammers send 100 million emails. Snapchatters send 527,000 photos, and the Weather Channel broadcasts 18 million forecasts. This and more data—properly collected, codified and analyzed—can be applied to automate almost any high-order task. Data can also serve as a surrogate for human experience and intuition. Online shopping and social media sites “learn” our preferences and use that information to make values-based assessments to influence our decisions and behavior. And, increasingly, machines excel in the tasks once thought uniquely human. Bart Selman is a professor of computer science at Cornell University and an expert in knowledge representation—basically, translating the real world into terms computers can understand and act upon. He cautions that computers do not yet have full human capabilities. For example, they lack “common sense” and an ability to grasp the deep meaning of language. They are unable to “make meaning” in the human sense, and this sometimes leads them down the wrong path. Still, he says, these shortcomings are likely temporary. “The [artificial intelligence] community believes that machines will match human intelligence within the next 15 to 20 years,” he says. Hod Lipson, a professor of mechanical engineering at Columbia University, directs the Creative Machines Lab, where he and his students train machines to be reflective, curious and, yes, creative—including in the kitchen. When we spoke, he was putting the final touches on a device that uses software to concoct beautifully composed gourmet delights from a jumble of pastes, gels, powders and liquid ingredients. From the looks of it, this machine could compete with a three-star Michelin chef and her entire staff. When I ran this thought by Lipson, he groaned. He says scientists and engineers like himself have a reflexive urge to automate almost every difficult task. The whole point of engineering, he says, is to alleviate drudgery and increase productivity; in the past, that was almost always the right thing to do, the good thing to do. But now he’s not so sure. It’s only a matter of time before robots replace surgeons in the operating theatre, according to cancer specialist virtual reality surgery pioneer Shafi Ahmed. As technology and artificial intelligence (A.I.) advances, jobs in banks and offices are set to be replaced by automation, according to industry experts. The clearest sign of how far A.I. has come was earlier this week, when against champion Lee Sedol. AlphaGo’s victory was seen as a major milestone for A.I. due to the complexity of the board game. But AlphaGo is only the tip of the iceberg for what A.I. can do, says Professor Andre Spicer, from Cass Business School. “According to some scenarios, A.I. will quickly replace many forms of complex knowledge work ranging from lawyers to librarians, professors to policy analysts,” Spicer said in a press release. Another occupation under threat from automation is the bank teller. In the future, ATMs will be able to perform most of their tasks, such as opening accounts and processing loans, according to Andy Mattes, CEO of software company Diebold. ATMs will be able to perform these functions at a fraction of the cost compared to human employees, said Mattes, as they will be able to check and process any paperwork. “The new machines will identify yourself: you can put your passport on it, they can scan documents, you can literally do anything online that you would’ve been able to do in front of a human being,” he explained. Office work is also set to change. Earlier this week, Blue Prism announced plans to debut on the London Stock Exchange. The company, which grew 35 percent in 2015, develops “software robots” which can perform clerical and administration tasks. A video commercial for the bot also shows that it has screens on the front and back to communicate with pedestrians. A screen on the front says “hello” while a screen on the back indicates its direction of travel and whether or not it’s about to stop. Self-driving car makers have experimented with similar technology, saying they help reduce accidents and misunderstandings between human and machine.